With millions of litres of water used daily on UK golf courses, this valuable commodity is both fundamental to the running of every successful golf club and a determining factor in your club’s competitiveness. Apart from the environmental imperative of saving water, it also makes good business sense, freeing up savings for other applications. The following are top tips in reducing your water usage for sustainable, responsible, cost-effective water management. Before you undertake any water conservation efforts, engage a professional to perform a thorough reconnaissance to determine water savings potential. A comprehensive water audit, combined with regular maintenance of irrigation systems, can reduce annual water usage on a golf course by up to 10%. These audits often uncover inefficiencies that can be corrected with simple maintenance and provide invaluable insights into usage. Want to save 50 000 to 500 000 gallons per annum or more on your golf course? Audits suggest this can be achieved through more efficient irrigation. Modern irrigation systems can be programmed to apply water precisely to where it’s most needed and in the exact quantity. Variegated irrigation heads apply water only to targeted areas while soil moisture sensors and weather-based irrigation controllers can automatically adjust irrigation schedules to suit local conditions. Adjust coverage seasonally and take heed of your course’s topography and drainage to avoid unnecessary, wasteful usage. By knowing your plants’ water needs, you will better know how to prioritise usage. Plant growth regulators can cut down water use by about 11% per year, while employing wetting agents or soil penetrants helps ensure the water you’re using will be readily absorbed into root systems. Also, give credence to aeration, sand topdressing, verticutting, and a good fertility management programme. From installing artificial turf on driving ranges to planting drought-tolerant and indigenous landscaping and converting turf from cool to warm season grasses, explore the alternatives when it comes to turf conversion and reduction to activate savings. On sites where a natural water supply is limited, alternative sources of water can be used to reduce the use of groundwater or offsite water supplies. Using reclaimed water or recycled storm water in suitable areas around the course (especially fairways, surrounding roughs, ablutions, and cooling towers) stands to minimise consumption. Sometimes requiring an investment in filtration infrastructure, the initial investment costs of this are off-set against long-term savings. Smarter Golf Energy is a team of brokers specifically servicing the golf industry. With abiding supplier relationships and industry knowledge, they aim to support development of the sport by uncovering utilities savings to bolster clubs’ bottom lines. 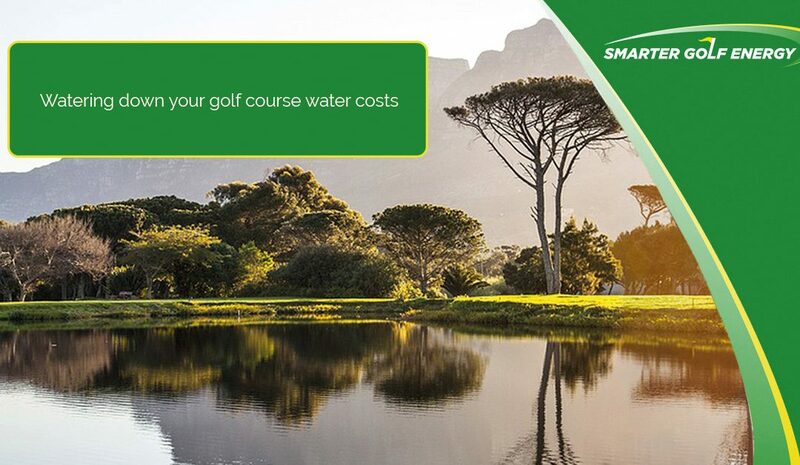 Contact Smarter Golf Energy today and let one of their water experts shop the market for the best tariffs for your club.